Nathan Hill tests this new programmable lighting system for marine tanks. Unlike some 'reviews' I’ve seen of this product elsewhere, I’ve chosen to actually use it and find out what it does, rather than simply copy the online Maxspect brochure. This is a superb light, but with a laborious programming system that makes me want to tear out the electrics and replace them with a set of dimmer switches, one for each channel. It’s a marine product and to use it on freshwater tanks and aquascapes would almost certainly turn your tank into a slush of bright green algae. This was annoying, as I wanted to stick it on a freshwater tank. However, for marines — what a spectrum! If you’re the kind of keeper that likes an ultra-low nutrient, ZEOvit-style aquarium, you’ll want this light. It’s that comprehensive and that well attuned to bring out the colours in corals. The LEDs involved leave no gaps in the light spectrum. This isn’t just a bank of the same LED over and over, it’s a balance of lights at specific wavelengths, rather than a ‘pile it all on and hope for the best’ approach. Less than half of the LEDs involved are white, being a mix of four 7,000-8,000K Cree XM-Ls and two 3,000K XP-Gs. What remains is a blend of blue, royal blue and actinic LEDs that make up parts of the blue spectrum between 400 and 490nm. With sixteen diodes in total, it’s basically sunbathing time for corals. Even better, you can change the lensing on your LEDs on an individual level, as they all come supplied in the box. If you want whites at 40° and blues at 120° that’s fine. Just unscrew the bottom of the unit, pop out some lenses and replace. Any combo, any pattern. Do what you want. Even better, you can change the LEDs. If one dies, just open the unit, pop it out and slip in a new one. It seems this is a unit for life. Want to tailor your LEDs to fit yourself? Again, no bother. Buy, install, job done. Adaptability is the name of the game. 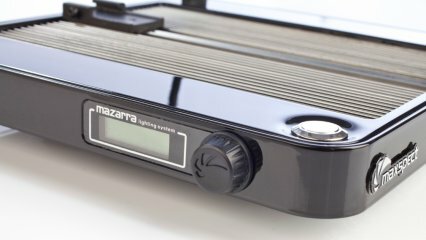 The rail mounting system allows you to point the Mazarra pretty much any way you want. Then there’s the lighting controlling and, for me, that’s where it falls down. If your idea of fun is a Rubik’s cube, or cracking the Enigma code, you’ll have a whale of a time. But if you’re like me, you’ll find the layout counter-intuitive and baffling. Even after many attempts I sat lost, manual in one hand and prodding buttons on the controller with the other. When you do find your way in, you can fiddle with all sorts of parameters. There are four channels, each one linked to four individual LEDs, and you can adjust each channel with a pre-set timer, so that each channel alters its intensity over eight time periods. In real terms, you can create a changing spectrum throughout the day. You can have dawn, build-up, intense mid-day, decline and dusk. You can incorporate weather simulations, sunny, cloudy or rainy days. You can even alter 'cloud' speed. You get a fan in the package, but the option to connect is yours alone. As it stands, a passive heat sink allows for much excess warmth to wick away, but you can simply clip the fan to the frame, connect the wire, and tell the unit at what temperature you want the fan to activate. This is assuming you can find your way in, which many times I couldn’t. However, in defence of the light, I am particularly rubbish at using controllers of this nature. I can’t knock build quality. The design is both accessible and simple, and refreshingly robust. Even holding the thing inspires confidence — it being a weighty, well-balanced lump. The mounting is tidy, sturdy and made of aluminium, so won’t pose too much of a cleaning or corroding problem. The LEDs are out of this world. Colouring and zooxanthellae stimulation is totally covered by the unit and the mounting and control features make it one of the most versatile units you’ll find out there. On the flip side, your only option at adjusting settings involves an awkward conflict with an abrasive controller. Give me a version of this light that I can connect to my laptop, programme and walk away from and this would probably be the best marine LED on the market.